Instant messaging applications are powerful. Because of their real-time message delivery, people consider using WhatsApp, FB messenger or a similar app to get in touch with relatives or friends. Messaging applications are not as secure as Android SMS apps. Sometimes, sending a text message by using the SMS service provided by the telecom operator is safer than sending a message through an instant messaging service. For example, will you send your bank account number to your lawyer, client, or any other person through WhatsApp? Some users may say yes but most users will avoid doing so considering the number of hacking incidents internet users saw in the last few years. One more situation where SMS service comes in handy is the online presence. If your friend isn’t online, he or she won’t receive the message you’ve sent with an instant messaging application. Although Android OS provides a stock SMS app with which we can send messages quickly, the application lacks several features. Fortunately, the Google Play Store offers a huge collection of free apps. Hence, we can easily replace the default SMS app with a better application. This application from Microsoft Corporation has 500+ million active users. It is the best SMS app. Unlike other applications that get into action straight away, SMS Organizer detects users location and prompts them to select a language of their choice when they run the app after installing it. It also asks users to verify their phone numbers. 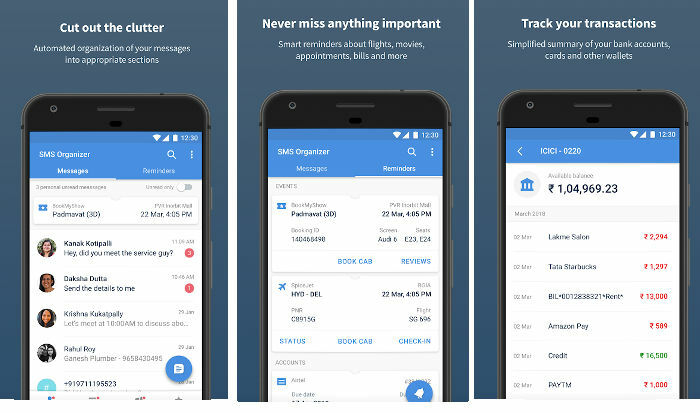 SMS Organizer enables you to set reminders. You can attach SMS to the reminders in SMO. The app features a powerful search tool which you can use to filter messages by their content. It provides a toggle option to show only the read/unread messages. SMS Organizer offers several customization options. By default, SO will make your phone vibrate, wake up, and display push notification when it receives a new SMS. You can disable these three features from the app’s setting interface. SMS Organizer won’t display notifications for promotional messages. It supports 12 and 24-hour time formats. Textra is a feature-rich Android application that requires several permissions to work as per your expectations. It has been developed by the developers of the most popular social bookmarking portal, Delicious. TSA has a beautiful user interface that displays SMS messages arranged by the date. It has the search option to find conversations or messages that carry a specific word or character. Specify a send delay and signature. Turn on/off delivery report for SMS or MMS. 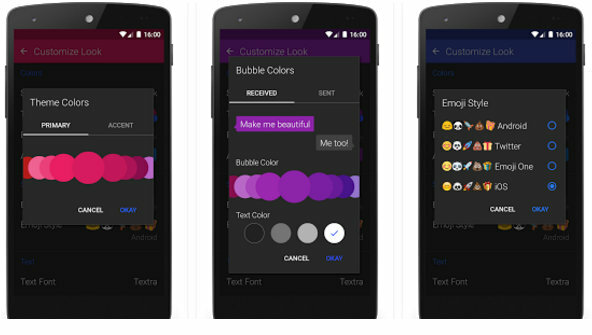 Textra Android SMS app allows you to customize the look and feels of the interface. You can change the theme, font, text size in TSA. Textra is one of the most download SMS apps on our list. It has an excellent rating of 4.5. If you’re an Android user, you must know that any application with 4.2+ ratings from a million users is damn good. Zero is a lightweight SMS application with the same number of users and rating as Textra. Its developer advertises Zero as a smart app that takes care of your privacy. Zero provides a pin code protection enabled private inbox where you can save personal messages. It lets you define a private number. Once you define this number, Zero will move SMS sent by it to the private folder. Zero has a message blocker feature which you can configure to blacklist SMS from certain numbers. It also allows users to discard SMS containing a specific word or phrase. You can configure it to alert you whenever it blocks an SMS. 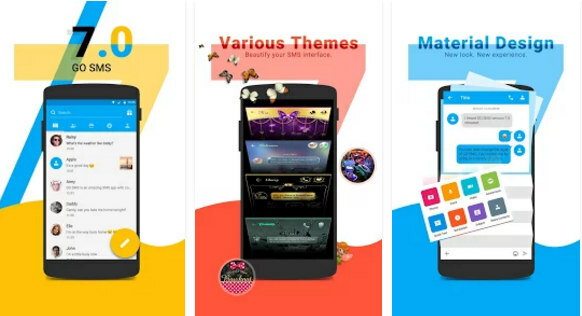 ZERO offers free themes. Users must download and apply themes manually in case they don’t like the default UI. 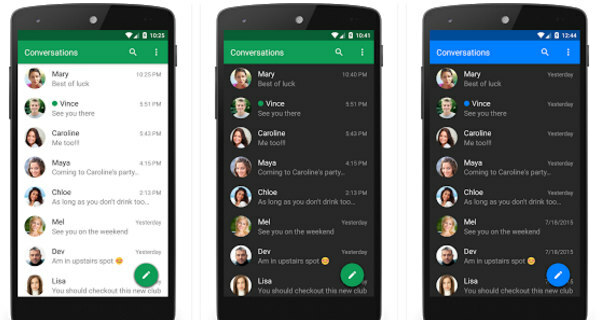 Zero is one of the fastest Android SMS apps. It is easy to use. It lets you pin messages. GO SMS Pro has a massive user base. It is brought to you by a team of developers behind over 50 popular applications on the Google Play Store. GSP offers more features than Textra and ZERO, but it forces you to make it as a default SMS application on your device. GO provides a better UI interface than the above two applications. It lets users stay focused on a specific conversation by providing sticky message feature. It has delay-to-send feature with which one can easily make changes to the message before the app dispatches it. GO SMS PRO enables you to mark a conversation with strangers as unwanted or unimportant. GSP provides a popup module to compose new messages and send them to a number of your choice. It has a private inbox module, an option to change theme font, and many cool features. Send SMS conversation as an email. Like Textra, CHOMP supports theming. 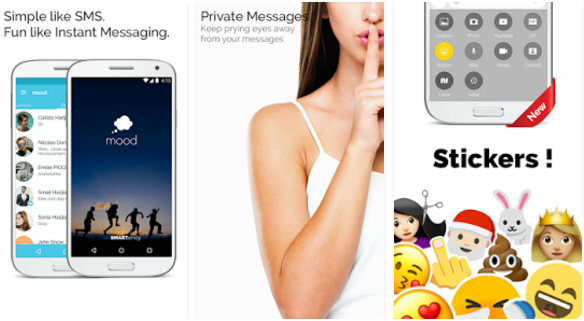 If you love using emojis in text messages, Mood messenger Android SMS app is for you. MM scans the words you type in the message and shows emojis relevant to the word you’ve entered. MM shows the number of messages sent/received in a conversation. It has a tabbed interface that lists contacts and SMS messages. This application allows you to search for specific messages. It supports UI customization and has a contact/number blacklist option. MM supports animated GIFs. It supports live background wallpaper. 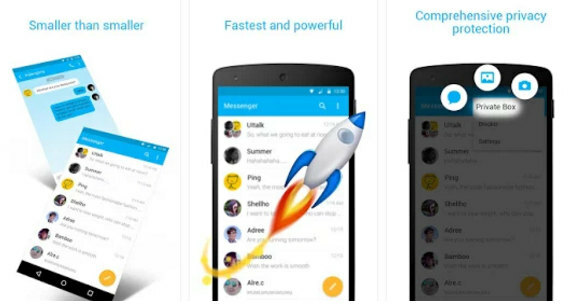 It allows users to share MMS with their friends. The app also enables users to share their location in real-time. Conclusion: If you are looking forward to replacing the stock Android SMS app on your phone, try out the feature-rich applications we’ve shared above.